Vermicelli Kheer or Semiya Payasam is a sweet dish which is made with vermicelli or seyaian, milk & sugar. It is made in every Indian household for special occasions like birthdays, weddings or other festive occasions. 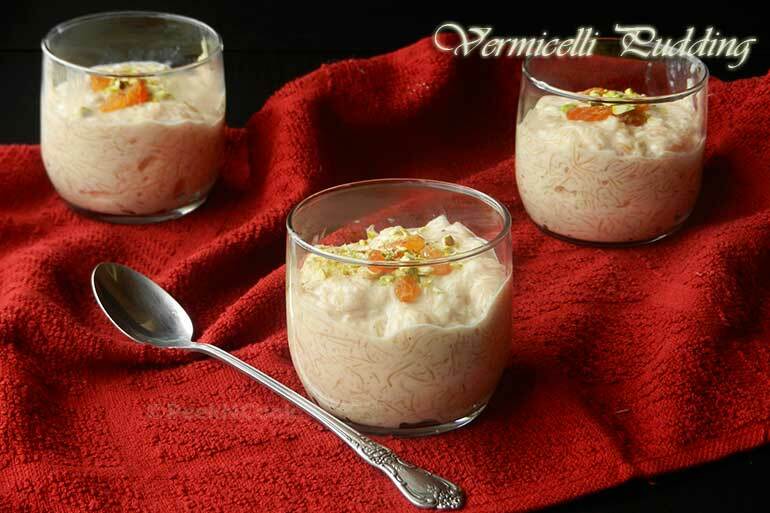 Vermicelli Kheere is a very tasty sweet dish, and healthy too. Vermicelli Kheer or Semiya Payasam is a sweet dish which is made with vermicelli or seyaian, milk & sugar. Heat 2 tbsp ghee in a pan and lightly fry the vermicelli till golden. Remove and set aside. Heat the remaining ghee in a separate pan and fry the nuts and raisins lightly and add the fried vermicelli and mix very gently. Now take the milk in a large heavy bottomed pan and add sugar . Bring to a boil, add the vermicelli mixture and let the liquid return to a boil, stirring constantly . Reduce the heat and simmer until the vermicelli becomes soft and your pudding looks thick. You can add some extra nuts on it to decorate the pudding. Add whole garam masala while frying the nuts, it will turn into sheer khurma.